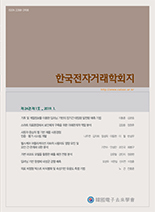 장원석, 지용구,(2011).스마트폰 증강현실 애플리케이션 사용자 인터페이스의 사용성 평가 방안.한국전자거래학회지,16(1),35-47. 스마트폰에서 위치 기반 서비스를 제공하는 증강현실 애플리케이션은 사용자에 대한 고려와 새로운 사용성 평가 방법을 요구하고 있다. 본 연구는 이러한 증강현실 애플리케이션 개발과 사용성 평가를 위한 사용성 원칙을 개발하고 이에 대한 전문가 평가를 목적으로 한다. 기존 연구와 스마트폰의 증강현실 애플리케이션의 특징 분석을 바탕으로 사용성 원칙을 개발하였다. 개발된 사용성 원칙을 이용하여 현재 대표적으로 사용되고 있는 세 개의 애플리케이션에 대해 전문가 평가를 수행한 결과 도출된 문제 리스트 중 세 가지 애플리케이션에 공통적으로 해당되면서 심각한 문제로 지적된 여섯 가지 문제 리스트와 개선을 위한 디자인 가이드라인이 도출되었다. 이 가이드라인을 통해 개선된 프로토타입을 제작하고 사용자 테스트를 진행하여 본 연구의 사용성 원칙과 전문가 평가의 효과성을 검증하였다. 본 연구의 결과는 스마트폰의 증강현실 애플리케이션에 대한 사용성 원칙 제시와 새로운 기술에 대한 사용성 원칙 개발을 통해 디자인 방향을 설계하고 사용성 평가를 진행할 수 있는 방안제시에 의의가 있다. Augmented reality applications offering location based service on smart phone require attention to users and new usability evaluation methods. The aim of this paper is to introduce new usability principles for application development and usability evaluation, and conduct expert evaluation on the augmented reality applications. We created a set of usability principles by analyzing characteristic of augmented reality applications, and conducted expert evaluation on three augmented reality applications primarily used by smart phone users. In expert evaluation and filtering procedure, we identified six usability problems that three applications have in common and the improvement guideline for the usability problems. The results of expert evaluation was verified by user test with a prototype that was developed using the guidelines. It is expect that the results of this study can be presented usability principles of the augmented reality application and a method of usability evaluation in the middle of new technology development process.